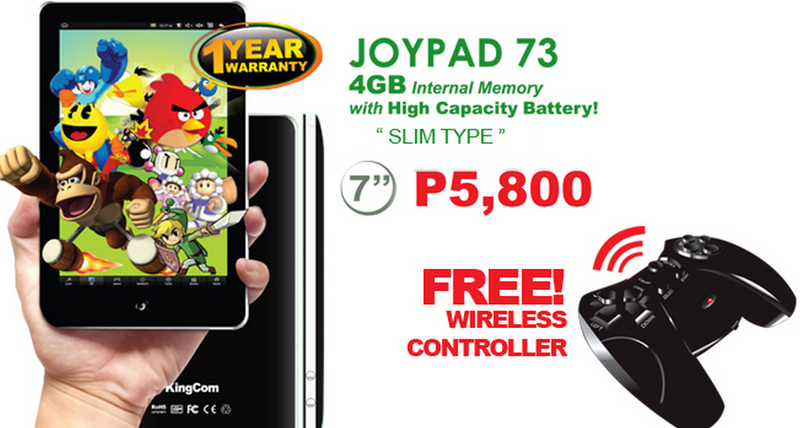 Joypad 73 is another affordable tablet-PC from Kingcom Digital, a popular Taiwan-based electronics company where it started in digital cameras, card readers, flash drives, video cameras, mp3/mp4 players, mobile phone battery packs, mobile chargers and speakers now evolved into mobile phone and even tablets. Joypad 73 a 7" WVGA-wide screen(800x480pixels) Android (2.2) Froyo Tablet with high performance 800MHz CPU+400MHz Digital Signal Processor and 2/ 4GB internal storage can support up to 32 GB of MMC-Micro SD. Joypad 73 is a 1.1 cm thick tablet with a built-in VGA camera, 4 way directional gravity sensor, WiFi 802.11b/g/n, and USB port. You can easily zoom in and zoom out images with two way touch, play high quality sound and video playback up to 4 hours(10 hours standby mode).Plus free application for Android market and multi-language support.